One of the software comparisons that comes up a lot with my clients is Ontraport vs ClickFunnels. To be honest, it's not an “apples to apples” comparison – Ontraport is a full-featured business automation platform and ClickFunnels (CF) fits closer into the landing page builder category. So for comparison sake, I'm going to compare Ontraport to ClickFunnels + Actionetics which is CF's answer to the marketing automation piece and will compare them on each individual feature set. I use both systems myself and with clients, and recommend one over the other based on a variety of factors. 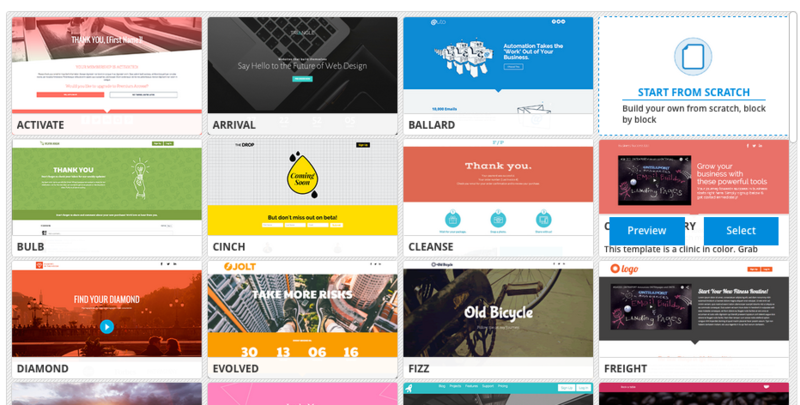 Ontraport's landing page builder Ontrapages allows you to create beautiful, responsive pages by stacking “content blocks” to create the desired look and feel. There are TONS of professionally designed templates available for free and a growing number for sale in their marketplace. Whether you start with a template or from scratch you've got lots of elements to choose from, including slideshows, pricing options, and coupon offers (FYI: ClickFunnels can probably create something that looks like a coupon offer but their checkout pages can't process coupon codes). One of my favorite features of Ontraport pages is their setting page. From the follow-up and tags they receive, to the page they see next, to removing them from a previous follow-up series or giving access to a course on your WordPress site, you have complete control of what happens when someone submits a form. This is where Ontraport truly shines since it's an all-in-one integrated system. 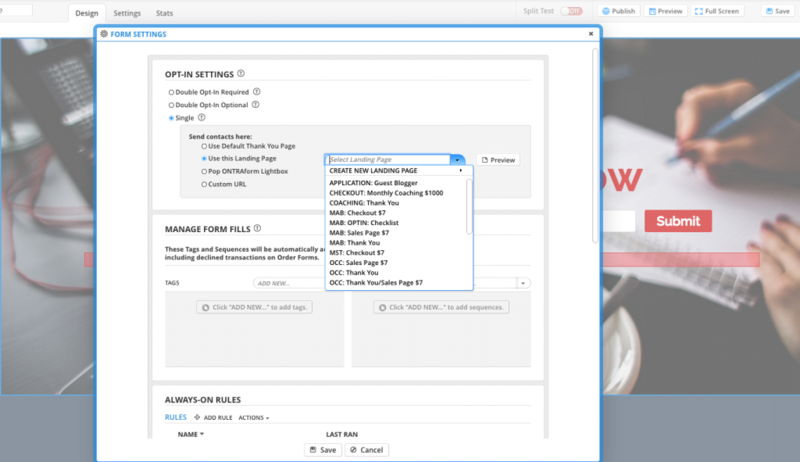 Ontraport Form Options: Every opt in form gives you complete control of your subscriber's experience. The only downside is that these pages are created by graphic designers (as opposed to marketers), and so far I haven't seen them convert as well as some of the dedicated page builder options. Totally subjective but that's been my observation so far. Ontraport also gives you unlimited page views, which means you can send as much traffic as you want and your cost will not go up. Nice! In ClickFunnels you don't typically create stand-alone pages as their wizard guides you through a process that creates your entire sales funnel really fast. 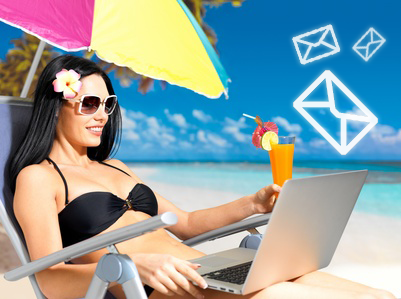 Optin pages, thank you pages are automatically connected making the creation of sales funnels point-and-click simple. 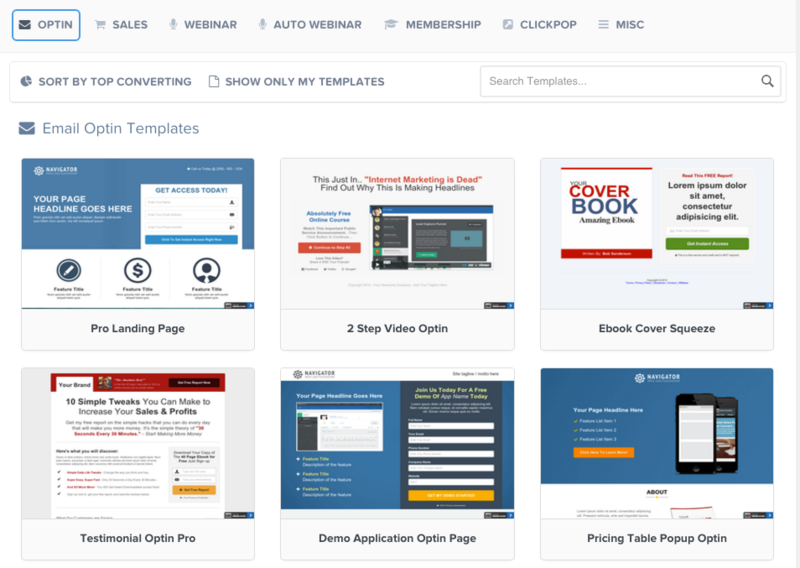 Their templates look great and were created by marketers to convert really well. They also include some extra elements like evergreen countdown timers (to create urgency), bulleted lists, and the ability to insert custom HTML onto the page (which Ontraport doesn't have). All that said, you don't have nearly the same level of control over what happens to a prospect once they opt in. You can do the most important things, like send them to a specific page and add them to a specific list. You also have limited page views depending on what package level you have so if you're working with a lot of traffic you'll need the upgraded package for sure. One feature you may like is their ability to integrate with a third-party autoresponder (you don't have to use Actionetics). So if you're already in love with your Aweber or GetResponse you can keep it. Both page builders are beautiful and easy to use, however building a sales funnel is initially a lot faster and more newbie friendly with Clickfunnels. On the other hand, Ontraport's advanced settings give you a ton more control after the opt in. To be fair, when it comes to landing pages, conversion should be #1 at the top of the list and after testing in mine and my client's accounts, and speaking with other users CF converts better. Keep in mind conversion rate is subjective based on all kind of variables… these were my results. Yours might be different. This is where the comparison breaks down a little since a basic ClickFunnels account doesn't include an autoresponder. That functionality only comes with their Actionetics upgrade coupled with a third-party email service like SendGrid, so that's what we'll be comparing. 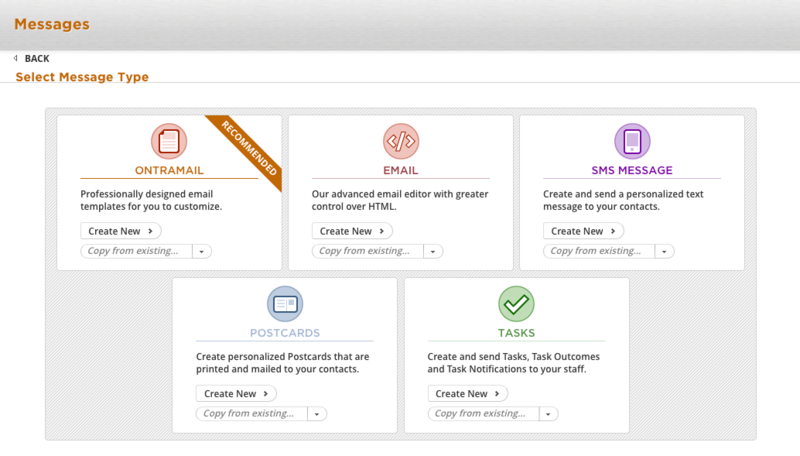 Ontraport's email marketing software is, in my humble opinion, the best there is. They send more than 45 million emails per week via their own servers and have some of the best delivery rates in the industry. With your pro Ontraport account you can have up to 25,000 contacts and send 100,000 emails per month… making them one of the most affordable email marketing services. You should note that Ontraport can do a whole lot more than email automation… built-in two-way SMS messaging and postcards are awesome too. Their new OntraMail uses the same “content block” builder as their landing pages so once you've learned to navigate one you're good. What really stands out though is their automation rules and the ability to segment your list based on any criteria you choose including website visits, link clicks, purchases or other general behavior. A great use case for this… let's say one of your subscribers clicks a link in an email where you're talking about red widgets; Ontraport tags that person with the interest “red widget” and automatically sends them an email about that exact red widget. Even better, let's say a subscriber visits your checkout page and doesn't buy. Your Ontraport system can automatically add them to a follow up process to try to recover the sale. They finally make a purchase Ontraport knows to stop that sales process and deliver their product. Those are a couple of super basic examples of automation but the power you have is truly unbelievable. Ontramail email templates. There are dozens to choose from and they can be sorted by type, industry, author or tags. The basic version of ClickFunnels has some built in email follow up you can use for optins, but there's no feature that allows you to send broadcasts or segment your list. You need to integrate a 3rd party autoresponder to do that. That's where Actionetics comes in which is their in-house autoresponder. I use the word “autoresponder” loosely here, as their software has to be integrated with a third-party like SendGrid in order to actually send emails. That's because they don't deliver your messages from their server. Not a huge deal, but just know you're going to have an additional integration and expense to deal with. I'm going to be completely honest here… as of this writing, Actionetics is not ready for prime time. It allows for very basic segmenting and after using it in several clients accounts I have found it cumbersome and lacking in features. It pains me to even say that because I really wanted to love it. If the ability to segment your email list is important to you (and it should be), pass on Actionetics until they've had more time to develop it. You'd be better off with a true autoresponder service like ActiveCampaign, Aweber or GetResponse. Or Ontraport. Examples of Actionetics email templates. Currently there are a total of 7 to choose from. Ontraport runs circles around ClickFunnels (Actionetics) when it comes to email… seriously, no competition. I feel a little guilty even putting them in the ring together… it would be like Bambi vs Godzilla, and we all know how that turned out. Ontraport has integrations with many popular payment processors including 1shoppingCart, ClickBank, SamCart, Shopify, UltraCart, WooCommerce, PayPal and Stripe. Setting up products is super easy and you can and options include trials, subscriptions, payment plans, allow the buyer to change quantity, include packing slip (for physical products) and insert coupon code. You also have the ability to add complex tax rules (ie charging different tax rates in different states or countries). Under shipping you can create different options (ie. 2 Day Shipping, 5 Day Shipping etc), you can choose not to show shipping based on location (for example only charge shipping on international orders). You also get to choose which invoice to send, which is helpful if you're running multiple businesses out of one account. All in all, it's a very feature-rich shopping cart with lots of integration options. ClickFunnels integrates with Stripe, Infusionsoft, JVzoo, ClickBank and Ontraport. It's interesting because JVzoo and ClickBank are affiliate marketplaces so probably not where you'd sell a coaching package for example. The only stand-alone payment processor on the list is Stripe which is strange, but since it's the integration I use and it works… great. If you're using another real shopping cart though it's not going to integrate. One cool feature they have is an integration with Taxamo that allows you to calculate EU VAT tax. So if you're selling into Europe and want to be compliant with their tax laws this is probably a feature to check out. On the flip side, there is no native way to calculate different tax rates for different locations or specify shipping options. ClickFunnels can't process coupons and doesn't allow trial periods either which is a bummer. What they can do is integrate with Disc.com and Kunaki which are fulfillment houses for when you want to send a physical product. Definitely a good feature if that's what you sell. This is another place where Ontraport is the clear winner, both from an integration standpoint and a features standpoint. Since both integrate nicely with Stripe the tie breaker here is Ontraport's ability to handle both free and paid trial offers and coupon codes. Sweet, sweet coupon codes. If you've never marketed with a coupon code, you haven't lived 😉 Seriously though, it's a nice feature. As exhaustive as I've tried to be, Ontraport and ClickFunnels have additional features that weren't covered in this review including affiliate program management (both), membership sites (both), lead tracking using UTM Variables (Ontraport only) and lead scoring (Ontraport Only). When did you write this? What was the date? that seems to be the perfect solution and combo no? The solution you outlined (coupling Ontraport Pro and ClickFunnels) seems perfect on the surface, but once you start to get into the integration there are problems. The biggest one is that Ontraport’s affiliate tracking doesn’t work with ClickFunnels. I guess if you don’t care about the affiliate tracking, or if you use a third-party tracker like iDevAffiliate it doesn’t matter. Also, the Ontraport’s tracking that allows you to fire cart abandon sequences etc doesn’t work with ClickFunnels so you definitely lose some functionality. There are workarounds for this, but it gets pretty complicated (aka frustrating/time-consuming). If I was using something like ActiveCampaign, GetResponse or ConvertKit I’d be all for using ClickFunnels. But the beauty of Ontraport is that it’s an all-in-one system, and having tried several times to get the integration to work I can say for sure I wouldn’t recommend coupling the two together. you are so knowledgeable thanks! all the functions with clickfunnels +activecampaigns? 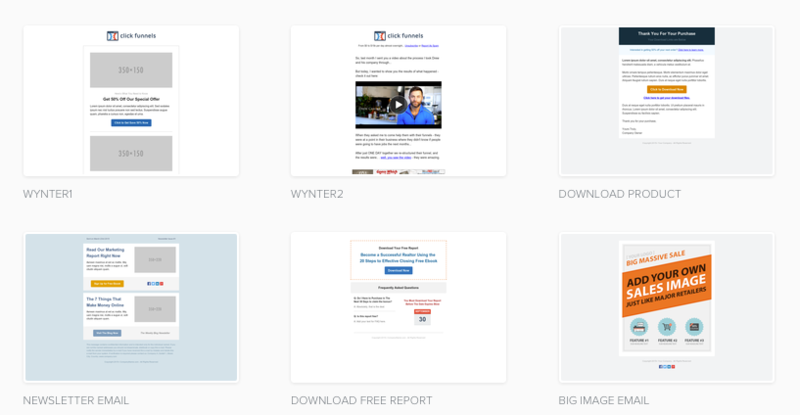 of clickfunnels makes it hard for me to pass on if this clickfunnel + activecampaign combo does it. (and just as good if clickfunnel +getresponse? I wouldn’t go with get response or aweber. They lack the marketing automation pieces that activecampaign includes. At the $50.00 a month Active Campaign is a steal! I have my fingers crossed they fixed actionetics… We’ll see. I agree with Ken – I’d definitely go with ActiveCampaign over GetResponse right now, but GR has actually added a new automation beta program into their system and so far it looks really promising. I think in the next year it will become a solid contender in the automation market. Hi Max, thanks so much for your comment! I think you’d have pretty much all your bases covered with ClickFunnels + ActiveCampaign. The reporting in both programs is actually quite good, it’s just not all in one place. As long as that doesn’t both you, no big deal. Just be aware that as your page views go up you’ll need to pay for the higher level of ClickFunnels, and that ActiveCampaign is actually quite expensive as your list grows (at 25K contacts it’s actually more expensive than Ontraport which has way more functionality). Wonderful article! Thank you. Question though, if you went the Ontraport and Clickfunnels route, couldn’t you just use the affiliate of one without the other? Loved your article and the way you think, analyze, and explain. Do you focus solely on selling your material and affiliate programs, or do you also provide consultation services. I would be interested in exploring with you the possibility of purchasing from you some amount of monthly hours of help with engaging potential users with our products that are designed to help behavioral professionals help others. I’d love to talk with you, if you’d be willing to spare a few minutes. My phone number is 262-325-0602 or If you emailed me your phone number I’d be happy to call you. Curious to know if you’ve gotten word about ONTRAPORT’s “The Future of Marketing” campaign? (ontraport.com/events/the-future-of-marketing) Seems as though they have something up their sleeve that might demolish ClickFunnels? Would love to hear what you think! What an interesting and insightful comment 😉 I’m sworn to secrecy but what I can tell you is that Ontraport’s upcoming release is going to be a game-changer that will definitely disrupt the marketing automation industry. And that’s not me hyping it up… it’s that good. Current Ontraport users are in for a treat! I’m currently in the process of ditching Ontraport for Clickfunnels. It’s just so damn easy to create a funnel that converts well and looks good, and it can be done without any tech help. I’m in love. Russell has a ton of information about how to be successful as well, which is nice. I’ll miss dynamic emailing, but not much. But the no discount code thing is KILLING ME! They seem to have some other really ghetto aspects that are leaving me in disbelief. I don’t think the perfect solution exists yet, Ontraport and Clickfunnels are still pieces of the hypothetical perfect puzzle. If you are a FunnelU member, you have a script that will add a discount code to CF. Hi Meg, glad you found the article useful. As far as less expensive solutions, you could look at something like ActiveCampaign or ConvertKit – you’d just have to make sure those autoresponders work with ClickBank. Both of them do segmentation well, although I’d lean more towards ConvertKit as I prefer their interface and their pricing doesn’t jump so much as your list grows. I hope this helps! Dawn, you recommend NOT using ClickFunnels integrated with Ontraport, how about both for different purposes? I love CF’s funnels … but I think Ontraport is the cat’s meow when it comes to automation. 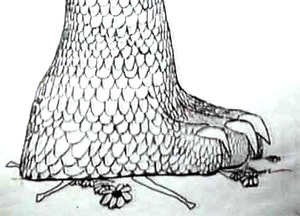 If I want to use CF for creating deep funnels how would you see integrating their use if not the actual platforms??? The integration between ClickFunnels and Ontraport is pretty good really – I particularly like the feature in CF that allows you to process payments using Ontraport as the gateway (I don’t know any other system that does that). I think you can use them together successfully, it’s just more to manage and you lose some of Ontraport’s functionality – specifically, affiliate tracking and the ability to run cart abandon sequences. It’s definitely a trade off, so if you’re using ClickFunnels because it converts better, you may not mind the extra set up and missing features. Dawn, thanks for the reply, that makes great sense to me. The affiliate functionality isn’t really an issue because I think ClickFunnels does that part of the equation better anyway. I would be running affiliate offers separate though their interface. And, frankly when it comes to funnels, IMO it’s all about conversion. Your answer is much appreciated. And, thanks for a great post too.